Anne Namba Designs Sale in S.F., S.J. You are at:Home»English»Nor Cal News»Anne Namba Designs Sale in S.F., S.J. Bridal Bustier with A-Line Skirt and Rose Gown. Items for sale (up to 50 percent off) will include designs for the groom and for the mother of the bride. 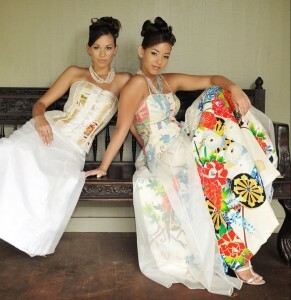 Namba uses the ageless beauty of Asian silks to create contemporary clothing for women and men. Her Kamani Street boutique in Honolulu carries a complete selection of ready-to-wear items. She also does a great amount of custom work. Her designs range from casual to business to her ever-increasing bridal business. For more information, visit www.annenamba.com or Namba’s Facebook page. Please let me know more about your trunk show coing up in San Francisco.